Dainius Žalimas is a Judge of the Constitutional Court of the Republic of Lithuania and, starting from 2014 to present, he is also the President of the Court. He is, at the same time, professor of international law at the Faculty of Law, Vilnius University. In 1996, he graduated from the Faculty of Law, Vilnius University, with a master degree in law (specialisation – international law). In 2001 he received a doctor’s degree (Ph. D., Law, Social sciences) from Vilnius University. 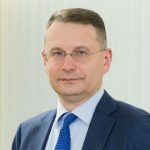 Other positions: in 2005-2011 – Member of the Permanent Court of Arbitration; in 1998-2011 – Legal Adviser to the Minister of National Defence of the Republic of Lithuania; in 2001-2011 – Chairman of National Commission on Implementation of International Humanitarian Law under the Ministry of National Defence of the Republic of Lithuania. Spheres of scientific interests: public international law, diplomatic and consular law, law of international organizations, responsibility of states, humanitarian law, constitutional law.